GAA chiefs in the county today announced they have taken control of the grounds. IMPROVEMENT PLANS FOR Dr Hyde Park will be a big step forward for Roscommon, according their star forward Donie Shine. After nearly 10 years of dispute, GAA chiefs in the county today announced they have taken control of the grounds. The Roscommon County board now intend to draft improvement plans for the ground of which they previously shared ownership with the local Roscommon Gaels Club. Dr Hyde Park has been criticised in recent years for their underdeveloped facilities and Shine has welcomed the proposed development. “It’s a really positive step for the county,” said Shine. “After the recent underage success recently and the senior going well now too. 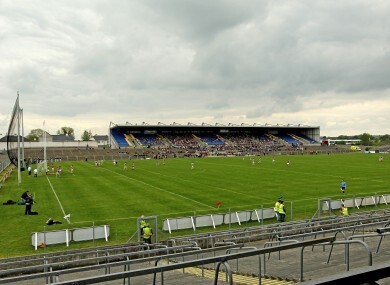 These plans will include the upgrading of the playing surface, spectator facilities and the incorporation of other facilities such as offices, catering facilities and indoor training facilities for all our inter-county teams, which are currently located elsewhere in Roscommon town. Email “Rossies star Donie Shine welcomes news of Dr Hyde Park revamp”. Feedback on “Rossies star Donie Shine welcomes news of Dr Hyde Park revamp”.